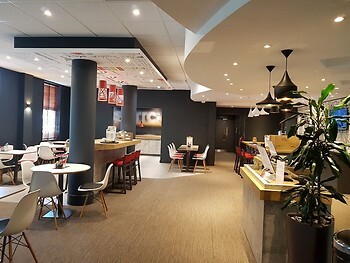 Hotel ibis Sheffield City, Sheffield, United Kingdom - Lowest Rate Guaranteed! With a stay at ibis Sheffield City, you'll be centrally located in Sheffield, just a 3-minute walk from Ponds Forge International Sports Centre and 6 minutes by foot from O2 Academy. This hotel is 0.3 mi (0.5 km) from Sheffield Hallam University and 0.4 mi (0.6 km) from Crucible Theatre. The car parking even with a discount the cost was £7:20 per night . The staff were very accommodating and friendly. Rooms were very clean and comfortable and the beds extremely comfy and had a good nights sleep. We were surpised at the quality of the hotel and the helpfulness of the staff particularly for the price we paid. The welcome and attention from the staff. The cleanliness and comfort of the room. The adequate and quality of the food in the restaurant. The hotel was fine, it was the behaviour of the other guests in the night. Children running in the corridor; people shouting to be let into their room; no on site parking. Good internet and entertainment facilities. Logos, brands, and other trademarks featured within this site are the property of their respective trademark holders. These trademark holders are not directly affiliated with Hotelsone. Ibis is a registered trademark.© 2001 - 2019 HotelsOne. All rights reserved.